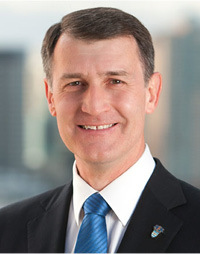 Following his appointment as Lord Mayor of Brisbane in April 2011, Graham Quirk was elected as Lord Mayor in the 2012 Brisbane City Council election. Graham has a long record of service to Brisbane and the local community, being first elected to Council in 1985. As a member of Civic Cabinet for over a decade, he has overseen key portfolios of infrastructure and finance, as well as serving as Deputy Mayor alongside Campbell Newman from 2008. Improving public transport with 500 new buses, 11 new CityCats, and introducing the CityGlider bus service and free City Hopper ferries. Enhancing Brisbane’s capacity for long-term economic growth and supporting measures that will attract more events, visitors and investment to the city. Graham grew up in Doomben, on Brisbane’s northside and currently lives in Eight Mile Plains with his wife, Anne, and three daughters – Sarah, Elizabeth and Charlotte. As Lord Mayor of Brisbane, Graham Quirk is committed to delivering for the residents of Brisbane and making this city a better place to live, work and invest in. Having joined the Mainpac team in 2014 as the Chief Operations Officer Darren was subsequently appointed Managing Director a year later. He is responsible for leading Mainpac to its next stage of growth with a focus on delivering great customer outcomes while building top line revenue and bottom line growth. Those who have worked with Darren, say he is an “Accomplished, results driven leader”. He has built purpose-driven and winning cultures by nurturing and empowering people. He has managed strategic and tactical planning for global and regional entities which have turned loss making business profitable, and made profitable businesses even more competitive. With strong competence in influencing and negotiation, Darren has mentored large sales teams and applied sales and marketing strategies to encourage both customer retention opportunities and business growth. Extensive operational experience has seen him establish strong market positioning and penetration, channel and pipeline creation and deal closures. Darren has more than 25 years experience in the IT sector having previously held senior executive sales and management positions at companies including Hewlett Packard, Logica, IDC Scheer and Silicon Graphics. 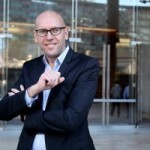 A leader, Darren’s multiple years’ experience in hitting targets in the sale of enterprise business software have held him in high esteem and has been consistently recognised as an executive who exceeds expectations, increasing margins and shareholder value, reducing operating expense, and directly driving revenue growth.